A floor drain style Backflow Valve is designed to allow sewage to flow in only one direction – from your floor drain to the Sanitary Sewer. Should the Sanitary Sewer become flooded, a properly installed and maintained Backflow Valve should prevent sewage from backing up through your floor drain. Make sure you have the right size Backflow Valve (available in 3 and 4 inch). Remove strainer (cover with holes or slots) and install Backflow Valve in floor drain. Install low enough so that strainer can be re-installed flush with floor. Tighten 4 screws to expand and seat Backflow Valve securely in pipe. Occasionally re-grease float rod and make sure float moves up and down freely. Backflow Valve must be installed securely and checked regularly to assure proper operation! 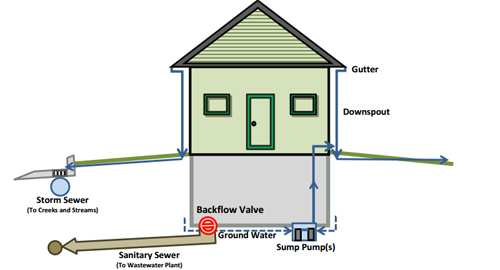 The Diagram below shows how a home should be plumbed to help prevent sewer backups and basement flooding. If your home is not properly plumbed and drained, you could experience a flooded basement or a sewer backup, especially during heavy rains. Homes that drain ground water, surface water and/or downspouts into the Sanitary Sewer (instead of the Storm Sewer) increase the possibility of flooded basements in their neighborhood, due to an overloaded Sanitary Sewer system. *The contents of this sheet are for informational purposes only. No guarantees, liability or warranty are expressed or implied by Orrville Utilities.